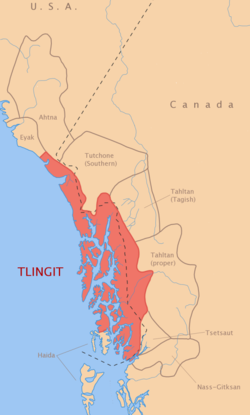 The Tlingit language ( /ˈklɪŋkɪt, -ɡɪt/;  Lingít [ɬìnkít])  is spoken by the Tlingit people of Southeast Alaska and Western Canada. It is a branch of the Na-Dene language family. Extensive effort is being put into revitalization programs in Southeast Alaska to revive and preserve the Tlingit language and culture. Missionaries of the Russian Orthodox Church were the first to develop a written version of Tlingit, using the Cyrillic script to record and translate it, when the Russian Empire had contact with Alaska and the coast of North America down to Sonoma County, California. After the Alaska Purchase, English-speaking missionaries from the United States developed a written version of the language using the Latin alphabet. The history of Tlingit is poorly known, mostly because there is no written record until the first contact with Europeans around the 1790s. Documentation was sparse and irregular until the early 20th century. The language appears to have spread northward from the Ketchikan– Saxman area towards the Chilkat region, since certain conservative features are reduced gradually from south to north. The shared features between the Eyak language, found around the Copper River delta, and Tongass Tlingit near the Portland Canal are all the more striking for the distances that separate them, both geographic and linguistic. Tlingit is currently classified as a distinct and separate branch of Na-Dene, an indigenous language family of North America. Edward Sapir (1915) argued for its inclusion in the Na-Dené family, a claim which was subsequently debated by Franz Boas (1917), P.E. Goddard (1920), and many other prominent linguists of the time. The Tlingit language is distributed from near the mouth of the Copper River down the open coast of the Gulf of Alaska and throughout almost all of the islands of the Alexander Archipelago in Southeast Alaska. It is characterized by four or five distinct but mostly mutually intelligible dialects, for which see below. Almost all of the area where the Tlingit language is endemic is contained within the modern borders of Alaska. Golla (2007) reported a decreasing population of 500 speakers in Alaska. The First Peoples' Cultural Council (2014) reported 2 speakers in Canada out of an ethnic population of 400. The northernmost dialect is called the Yakutat (Yakhwdaat) dialect, after its principal town. The Northern dialect is spoken in an area south from Lituya Bay (Litu.aa) to Frederick Sound. The Transitional dialect, which is a two-tone dialect like the Northern, but which has phonological features of the Southern, is historically spoken in the villages of Petersburg (Gántiyaakw Séedi "Steamboat Canyon"), Kake (Khéixh' "Daylight"), and Wrangell (Khaachxhana.áak'w "Khaachxhan's Little Lake"), and in the surrounding regions, although it has almost disappeared. The similarly moribund Southern dialects of Sanya and Heinya are spoken from Sumner Strait south to the Alaska-Canada border, excepting Annette Island, which is the reservation of the Tsimshian, and the southern end of Prince of Wales Island which is the land of the Kaigani Haida (K'aayk'aani). The Inland Tlingit dialect is spoken in Canada around Atlin Lake and Teslin Lake. The Tongass Tlingit dialect was once spoken in the Cape Fox area south of Ketchikan, but recently died with its last speakers in the 1990s. The tone values in two-tone dialects can be predicted in some cases from the three-tone values, but not the reverse. Earlier it was hypothesized that the three-tone dialects were older and that the two-tone dialects evolved from them. However, following Jeff Leer's discovery of the Tongass dialect in the late 1970s, it has been shown[ citation needed] that the Tongass vowel system is adequate to predict the tonal features of both the two-tone and three-tone dialects, whereas none of the tonal dialects could be used to predict vocalic feature distribution in Tongass Tlingit. Thus Tongass Tlingit is the most conservative of the various dialects of Tlingit, preserving contrasts which have been lost in the other dialects. The fading and glottalized vowels in Tongass Tlingit have also been compared with similar systems in the Coast Tsimshian dialect. But, Krauss and Leer (1981, p. 165) point out that the fading vowels in Coastal Tsimshian are the surface realization of underlying sequences of vowel and glottalized sonorant, i.e. VʔC. This is in contradistinction to the glottal modifications in Tongass Tlingit which Leer argues are symmetric with the modifications of the consonantal system. Thus a fading vowel V̤ is symmetric[ clarification needed] with an aspirated consonant Cʰ, and a glottalized vowel Vʔ is symmetric with an ejective (glottalized) consonant Cʼ. This implies that the two systems have no familial relationship. Leer (1978) speculated that the maintenance of the pretonal system in Tongass Tlingit was caused by the proximity of its speakers around the Cape Fox area near the mouth of the Portland Canal to Coastal Tsimshian speakers just to the south. Tlingit has a complex phonological system compared to Indo-European languages such as English or Spanish. It has an almost complete series of ejective consonants accompanying its stop, fricative, and affricate consonants. The only missing ejective consonant in the Tlingit series is pronounced [ʃʼ]. Tlingit is also notable for having several laterals but no voiced [l], and no labials in most dialects, except for [m] and [p] in recent English loanwords. Consonants in the popular orthography are given in the following table, with IPA equivalents in brackets. Marginal or historical phonemes are given in parentheses. The consonant m is a variant of w found in the Interior dialect, for example in amsikóo "(he) knew it", which would be awsikóo in the Coastal dialects. It is not strictly an allophone as Interior speakers appear to distinguish the two; it is more likely that the distinction is allomorphic. The consonant ll is an allophone of n now mostly obsolete, but still occasionally heard among the oldest speakers, particularly in the Interior dialect. However its former allophony with n is still evident in many Tlingit loanwords where n replaces the [l] in the source language, such as sgóon "school". The consonant ÿ (/ɰ/) has recently merged with (/j/) y or (/w/) w depending on the phonological environment, with w next to rounded vowels and labialized consonants, and y elsewhere. It shows up as a g occasionally in placenames derived from Tlingit during the eighteenth and nineteenth centuries, as well as in some broad transcriptions by earlier anthropologists, e.g. "Gan Gulihashee Hit" for Ÿan Ÿuliháshi Hít "Drifted Ashore House" as recorded by Olson, today written Yan Wuliháshi Hít. Because the use of y versus w is predictable from context where it was originally a ÿ, this graph is used consistently in linguistic transcription, but not in ordinary writing. Note that this consonant has been erroneously referred to as "gamma", confused with the similar [ɣ] which is however the voiced velar fricative, not an approximant. Leer (1991) argues the existence of two labialized glottal consonants, [ʔʷ] and [hʷ], which could be written in the popular orthography as .w and hw. The latter sound does appear in the speech of some speakers, but only in the highly variable word oohwaan ("first person plural independent pronoun"). This particular word is also pronounced (and hence spelled) oohaan, hoowaan, and oowaan among other variations. The labialized glottal stop is not attested in any Tlingit transcriptions or recordings, although speakers seem to be able to produce it when requested. Nasal consonant assimilation with /n/ and the velar and uvular plosives is common among Tlingit speakers of all dialects. For example, the sequence nk (/nk/) is often heard as [ŋk] and nkh (/nq/) as [ɴq]. Native speakers in a teaching position may admonish learners when they produce these assimilated forms, deriding them as "not Tlingit" or "too English", but it is not uncommon to later hear the speakers producing these forms themselves. It is uncertain whether this assimilation is autochthonous or if it arose from contact with English, although the former is more likely from a purely articulatory perspective. Young speakers and second language learners of Tlingit are increasingly making a voiced/unvoiced distinction between consonants rather than the traditional unaspirated/aspirated distinction. This is due to the influence of English and its similar distinction. For speakers which make the voiced/unvoiced distinction the distribution is symmetrical with the unaspirated/aspirated distinction among other speakers. Maddieson, Smith, and Bessel (2001) note that all word final non-ejective stops are phonemically unaspirated. This contrasts with the orthography which typically represents them as aspirated stops, e.g. t [tʰ] for the more accurate d [t]. There is wide variation in ordinary speech, ranging from unreleased [t̚] to a very delayed aspiration [tːʰ]. However the underlying phoneme is certainly unaspirated /t/ because it is consistently produced when the word is suffixed. The orthography usually but not always reflects this, for example hít "house" is written (du) hídi "(his) house" when marked with the possessive suffix -ÿí. It is possible that aspirated and unaspirated stops are collapsed into a single phoneme word-finally, however this has not been verified. Maddieson and colleagues also confirm that the ejective fricatives in Tlingit are in fact true ejectives. This is counter to the widely held assumption that ejective fricatives are not actually phonetically ejective, but are instead produced as a sequence of fricative and glottal stop. In Tlingit, at least, the articulation of ejective fricatives does include complete closure of the glottis before frication begins, and the larynx is raised in the same manner as with ejective stops. Characteristically, the ejective fricatives in Tlingit feature a much smaller aperture for frication than what is found in ordinary fricatives. This articulation provides increased resistance to counter the continual loss of dynamic airstream pressure. In addition, ejective fricatives appear to include tightening of the pharyngeal muscles which reduces the diameter of the air column and thus further increases pressure. This pharyngeal constriction is not true pharyngealization, however, since the diameter is still greater than that found in pharyngealized consonants in other languages. Tlingit has eight vowels, four vowels further distinguished formally by length. However, the length distinction is often in terms of tenseness rather than length, particularly in rapid speech. For the Northern dialect, the dominant spoken dialect of Tlingit and the standard for written Tlingit, every vowel may take either high or low tone; in the orthography high tone is indicated by an acute accent, e.g. áa, and low tone is unmarked, e.g. aa. The Southern and Transitional dialects have a mid tone which is unmarked and additional low tone which is marked by a grave accent, e.g. àa. As noted in the vowel chart above, there is an allophone of /aː/ (orthographic aa) which is realized as [ɒː] under the influence of uvular consonants, however this is not consistent for all speakers. The backness influence arises from articulation with uvular consonants, thus the word kháa "person" is often spoken as [qʰɒ́ː], whereas the word (a) káa "on (its) surface" is said as [(ʔʌ) kʰáː] by the same speakers. Word onset is always consonantal in Tlingit, i.e. no word may begin with a vowel. Where one would occur theoretically by e.g. prefixing or compounding, the vowel is obligatorily preceded by either [ʔ] or [j]. The former is universal in single words, and the latter is found varying with [ʔ] in word-medial position in compounds. The orthography does not reflect the [ʔ] in word-initial position, but either . or y may be seen in medial position. For example, the word khoowat'áa "the weather is hot" (khu-ÿu-ÿa-t'áa, INDH.OBJ-PERF-(0, -D, +I)-hot) is phonetically [qʰuːwʌtʼáː], but when the perfective prefix ÿu- is word initial in uwat'áa "it is hot" (0-ÿu-ÿa-t'áa, 3NEU.OBJ-PERF-(0, -D, +I)-hot) the phonetic form is [ʔʊwʌtʼáː] where the glottal stop appears to ensure that the word begins with a consonant. Until the late 1960s, Tlingit was written exclusively in phonetic transcription in the works of linguists and anthropologists, except for a little known Cyrillic alphabet used for publications by the Russian Orthodox Church. A number of amateur anthropologists doing extensive work on the Tlingit had no training in linguistics whatsoever and left numerous samples in vague and inconsistent transcriptions, the most famous being George T. Emmons. However, such noted anthropologists as Franz Boas, John R. Swanton, and Frederica de Laguna have transcribed Tlingit in various related systems which feature accuracy and consistency, though sacrificing readability. Two problems ensue from the multiplicity of transcription systems used for Tlingit. One is that there are many of them, thus requiring any reader to learn each individual system depending on what sources are used. The second problem is that most transcriptions made before Franz Boas's study of Tlingit have numerous mistakes in them, particularly because of misinterpretations of the short vowels and ejective consonants. Thus it is important to check any given transcription against similar words in other systems, or ideally against a modern work postdating Naish and Story's work in the 1960s. Despite not being a fusional language, Tlingit is still highly synthetic as an agglutinating language, and is even polysynthetic to some extent. The verb, as with all the Na-Dené languages, is characteristically incorporating. Nouns are in comparison relatively simple, with many being derived from verbs. Tlingit word order is SOV when non- pronominal agent and object phrases both exist in the sentence. However, there is a strong urge to restrict the argument of the verb phrase to a single non-pronominal noun phrase, with any other phrases being extraposed from the verb phrase. If a noun phrase occurs outside of the verb phrase then it is typically represented in the verb phrase by an appropriate pronoun. Tlingit has a complex system of pronominals, which vary depending on their relationship to the verb. The subject pronominals are incorporated into the verb in its subject slot. The object pronominals are also technically incorporated into the verb (i.e. the verb "complex"), but most are graphically independent. They are divided into three classes, the verbal object, nominal object, and postpositional object. There are also the independent pronominals which are completely separate from the verb and can be used in dependent clauses or in subject or object position. The pronominals all have related semantic values, and their organization can hence easily be visualized in a table. The numbers in the first column represent the usual concept of person, i.e. first, second, or third. Story and Naish identified a fourth person, but this term is inappropriate since they did not describe a clear separation between the so-called fourth person and the other impersonal pronominals. When analyzing a sentence, the pronominal type is given first, then the form (subject, object, independent) is given following a period. This uniquely represents the pronominal as a two dimensional unit. Thus 1SINGULAR SUBJECT is the first person singular subject pronominal, realized as xhat. The RECIPROCAL does not uniquely identify one of the two reciprocal pronominals, but since they are both phonetically identical as woosh, it is generally unnecessary to uniquely identify them. There is also a notional zeroth person which can be of subject, object, or independent form. This is not realized in Tlingit, instead it is an empty placeholder for analysis. The subject pronominals are all incorporated into the verb. Thus when the subject is represented as a pronominal, the subject position of the sentence is empty. Object pronominals are divided into three classes, the verbal, nominal, and postpositional. The verbal object pronominals function similarly to the subject pronominals in that they preclude an explicit object when used. The nominal object pronominals are similar in some respects to the possessive pronouns of English. They precede a noun and represent the object of the noun, typically implying possession of the noun. Postpositional object pronominals function as objects to which postpositions are attached. They act as the object of a postposition in a manner similar to an ordinary noun suffixed with a postposition. Strictly speaking, the Tlingit directionals can be classified as nouns on the basis of their syntactic function. However, they form a distinct semantic set of nouns which indicate direction relative to some stated position. They also show stem variation depending locative suffixation, in particular with the allative suffix -dei. These stem variants also occur with the adverb construction N1-da-N2-(i)n "N2 N1-ward" where N2 is an anatomic noun and N1 is a directional stem. Particles function as neither noun nor verb. They are restricted to positions relative to phrases in the sentence. The focus particles are particles which follow the left periphery ("forephrase" per Leer) of a sentence. The Naish-Story term for them is "post-marginals". Many may be suffixed with a demonstrative (-yá, -hé, -wé, -yú), also they may be combined with the interrogative (-gé). Focus particles are stylistically written as separate words, although phonetically they may be indivisible from the preceding utterance. gé — dubitative, unlikelihood, "perhaps", "maybe, "it would seem..."
ásé — discovery, understanding of previously unclear information, "oh, so..."
xháa – softening, "you see"
shágdéi — dubitative, likelihood, "perhaps", "probably"
dágáa — emphatic assertion, "indeed", "for sure"
gwshéi, gushéi — rhetorical interrogative, request for corroboration, "I wonder", "perhaps"
óosh — hypothetical, "as if", "even if", "if only"
The combination of the focus á with the demonstratives gives the frequently used particles áyá and áwé, and the less common áhé and áyú. Combination of the interrogative ágé with the demonstratives gives the confirmative particles ákwé and ákyá (ák-hé and ákyú are uncommon), used to elicit a yes/no response from the listener. The interrogative ágé also usually contracts to ág before tsú "also", e.g. ág tsú "also?" < ágé + tsú. The particle sá is obligatory in forming wh-question phrases. It can be combined with a demonstrative, with the dubitative, the rhetorical interrogative, and the emphatic assertion, as in the list below. sáwé (< sá + áwé), sáyá, ... — focused question, "... is that?" sgé (< sá + gé) — dubitative question, "maybe? ", "perhaps?" sdágáa (< sá + dágáa) — "(what) on earth? ", "really?" Phrasal particles may occur after focus particles that occur with or without demonstrative finals. The following are postphrasal particles, thus they may only occur after the phrase that they modify. déi — "now", "this time"
x'wán — "be sure to"
tsé — "be sure not to"
Except for x'wán and tsé, the above may occur after the focus particles. The following are prephrasal particles, i.e. they occur before the phrase that they modify. Naish and Story call these "pre-marginals". ch'a — "just", "the very"
These particles may occur before or after any phrase in a clause. tlei — "just," "simply," "just then"
déi — "already," "by now"
tsu — "again", "still", "some more"
Compare the mobile particle tsu with the postphrasal particle tsú. Both the sentence káaxwei tsu eetéenaxh xhat yatee "I need more coffee" and the sentence káaxwei tsú eetéenaxh xhat yatee "I also need coffee" are acceptable. However the sentence *tsú káaxwei eetéenaxh xhat yatee is syntactically inadmissible because the particle tsú is postphrasal, i.e. it cannot precede the phrase it modifies, in this case the noun phrase káaxwei. The corresponding sentence with the tsu particle in front, tsu káaxwei eetéenaxh xhat yatee "I need coffee again/still" is in contrast syntactically acceptable. Thus a Tlingit listener will recognize the tsu particle in a phrase-initial position without confusion but tone is necessary to distinguish it in a phrase-final position. For this reason the tsu particle is often used prephrasally although it is syntactically admitted in either position. Thus the song name Tsu Héidei Shugaxhtootaan could also be héidei tsu shugaxhtootaan, but placing the tsu in front has the advantage of unambiguity, and thus seems more euphonious to native speakers. The particle tlei is easily confused with tléil "no, not", but as with the tsu/tsú pair the tone makes them unambiguous. These particles may only occur at the front of a sentence. Naish-Story term these "clause marginals". tléik, l — negative, "not"
khaju, xhaju — contrary, "actually", "in fact"
The Irish TV series An Klondike (2015–17), set in Canada in the 1890s, contains Tlingit dialog. ^ Bureau, US Census. "Detailed Languages Spoken at Home and Ability to Speak English". www.census.gov. Retrieved 2017-11-01. ^ "Census in Brief: The Aboriginal languages of First Nations people, Métis and Inuit". www12.statcan.gc.ca. Statistics Canada. Retrieved 2017-11-01. ^ "Alaska OKs Bill Making Native Languages Official". npr.org. ^ Hammarström, Harald; Forkel, Robert; Haspelmath, Martin, eds. (2017). "Tlingit". Glottolog 3.0. Jena, Germany: Max Planck Institute for the Science of Human History. ^ Golla, Victor (2011). California Indian Languages. University of California Press. p. 303. ISBN 978-0-520-26667-4. ^ Twitchell, Lance A (2014-04-23). "HB 216 and the emotions of language revitalization". Alaska Dispatch. Retrieved 2014-05-05. Beck, David. (2001). "Conventionality and lexical classes", pp. 19–26 in Proceedings of WSCLA 5: The Workshop on Structure and Constituency in Languages of the Americas, Gessner, Suzanne; Oh, Sunyoung; & Shiobara, Kayono (eds.). Volume 5 of Working Papers in Linguistics. University of British Columbia: Vancouver, British Columbia. Bird, Sonya. (2001). "What is a word? Evidence from a computational approach to Navajo verbal morphology", pp. 27–35 in Proceedings of WSCLA 5: The Workshop on Structure and Constituency in Languages of the Americas, Gessner, Suzanne; Oh, Sunyoung; & Shiobara, Kayono (eds.). Volume 5 of Working Papers in Linguistics. University of British Columbia: Vancouver, British Columbia. Boas, Franz. (1917). Grammatical notes on the language of the Tlingit Indians. University of Pennsylvania Museum anthropological publications. Dauenhauer, Nora M.; & Dauenhauer, Richard (Eds.). (1987). Haa Shuká, Our Ancestors. Number 1 in Classics of Tlingit Oral Literature. University of Washington & Sealaska Heritage Foundation: Seattle, Washington. ——— (1990). Haa Tuwunáagu Yís, For Healing Our Spirit. Number 2 in Classics of Tlingit Oral Literature. University of Washington & Sealaska Heritage Foundation: Seattle, Washington. ——— (Eds.). (1994). Haa K̲usteeyí, Our Culture: Tlingit life stories. Number 3 in Classics of Tlingit Oral Literature. University of Washington & Sealaska Heritage Foundation: Seattle, Washington. ——— (Eds.). (1995). "A Tlingit ceremonial speech by Willie Marks", pp. 239–244 in Dürr, M; Renner, E.; & Oleschinski, W. (Eds. ), Language and Culture in Native North America: Studies in honor of Heinz-Jürgen Pinnow. Number 2 in LINCOM Studies in Native American Linguistics. LINCOM: Munich, Germany. ISBN 3-89586-004-2. ——— (2000). Beginning Tlingit, 4th ed. Sealaska Heritage Foundation Press: Juneau, Alaska. ISBN 0-9679311-1-8. First edition 1994. ——— (2002). Lingít X̲'éinax̲ Sá! Say it in Tlingit: A Tlingit phrase book. Sealaska Heritage Institute: Juneau, Alaska. ISBN 0-9679311-1-8. ——— (2002). Intermediate Tlingit (draft). Manuscript. Dauenhauer, Richard. (1974). Text and context of Tlingit oral tradition. PhD dissertation. University of Wisconsin: Madison, Wisconsin. Dryer, Matthew. (1985). "Tlingit: An object-initial language? ", Canadian Journal of Linguistics 30:1–13. Goddard, Pliny Earle. (1920). "Has Tlingit a genetic relationship to Athapascan", International Journal of American Linguistics 1:266–279. Leer, Jeffery A. (1979). Proto-Athabaskan Verb Stem Variation, Part One: Phonology. Volume 1 in Alaska Native Language Center Research Papers. Alaska Native Language Center: Fairbanks, Alaska. ——— (1990). Tlingit: A portmanteau language family? In P. Baldi (Ed. ), Linguistics change and reconstruction methodology (pp. 73–98). Mouton de Gruyter: Berlin, Germany. ——— (1991). The Schetic Categories of the Tlingit verb. PhD dissertation. University of Chicago Department of Linguistics: Chicago, Illinois. ——— (2000). "The negative/irrealis category in Athabaskan–Eyak–Tlingit", ch. 6 pp. 101–138 in The Athabaskan Languages: Perspectives on a Native American Language Family, Fernald, Theodore B. & Platero, Paul R. (eds.). Volume 24 in Oxford Studies in Anthropological Linguistics. Oxford University Press: Oxford, England. ISBN 0-19-511947-9. Leer, Jeff; Hitch, David; & Ritter, John. (2001). Interior Tlingit Noun Dictionary: The dialects spoken by Tlingit elders of Carcross and Teslin, Yukon, and Atlin, British Columbia. Yukon Native Language Center: Whitehorse, Yukon. ISBN 1-55242-227-5. Maddieson, Ian; Smith, Caroline L.; & Bessell, Nicola. (2001). Aspects of the phonetics of Tlingit. Anthropological Linguistics 43(2): 135–176. Naish, Constance M. (1966). A syntactic study of Tlingit. Master's dissertation. University of North Dakota. Pinnow, Heinz-Jürgen. (1962). "Two problems of the historical phonology of Na-Dene languages". International Journal of American Linguistics, 28:162–166. ——— (1966). Grundzüge einer historischen Lautlehre des Tlingit: ein Versuch. Wiesbaden: Harrassowitz. Swanton, John. (1911). " Tlingit", pp. 159–204 in Handbook of American Indian Languages. U.S. Government Printing Office: Washington, D.C.
Swanton, John Reed (1909). Tlingit myths and texts. Govt. Printing Office. Retrieved 26 August 2012.